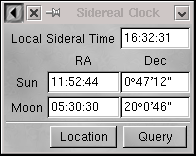 SClock is a very simple sidereal clock program for RISC OS, and now Linux. Sidereal time is calculated using code from Numerical Recipes in C. The Right Ascension and Declination of the Sun and the Moon are calculated using the low precision formulae given in the Astronomical Almanac. A parallax correction is applied to the Moon position, depending on your RA and dec. No correction is applied to the Sun position, as it is insignificant compared with the accuracy of the formulae. Normally the SClock display counts up with passing time. But if you want to calculate the ST, RA and Dec at a particular time and date, go to Query. This is in the same format as the standard RISC OS Alarm program. After Set is hit the main SClock window will report the query results. After a few seconds, or a mouse click in the main window, it will revert to normal. Don't forget to set the latitude and longitude appropriate to your location. This is my first go at using automake, &c, so please don't hold back from telling me about any problems!